Marvin Lee Aday (also called Meat Loaf; born September 27, 1947) is an American singer and musician. He plays rock and roll, heavy metal and hard rock. He recorded the single "I'd Do Anything for Love (But I Won't Do That)" in late 1993. He has also appeared in over fifty movies and television shows. He was born in Dallas, Texas. His album, Bat Out Of Hell, has sold over 43 million copies. He was in the movie The Rocky Horror Picture Show. ↑ Hann, Michael (3 April 2013). "Meat Loaf's farewell tour: 'This time, they're not going to rope me back in'". The Guardian. Retrieved 22 February 2016. 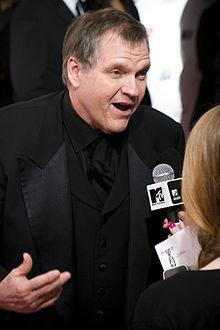 ↑ "Meat Loaf - Biography". Rolling Stone. 2001. Retrieved 22 February 2016.